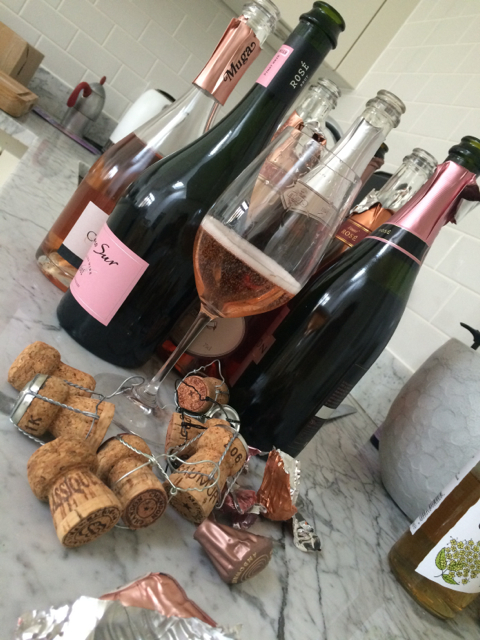 In The Telegraph this weekend I’ve written about pink sparkling wine – yes, the summer rosé season is well and truly open. For some reason, my recommendations for wines under a tenner haven’t made it online so I’m reproducing them here for anyone who missed the print version and who would like to celebrate the first Sunday after the spring equinox with a glass of fizz. (Note: Those of you who came to my first how to drink with chilli & spice class will recognise the one from the Loire – it’s the ‘pale one’ that everyone liked so much). In other news: A busy, busy couple of weeks ahead. I’ve just finished writing my talks for our first Telegraph Champagne Festival next weekend. It kicks off in Reims with 100 readers, 5 fabulous champagne producers (Gosset, Charles Heidsieck, Dom Perignon, Bollinger and Pol Roger) and 1 feast of a dinner – and that’s just the Friday night. We go on until the Sunday, with more and more wines, and more and more food, and if no one needs a bit of a sit-down by the end of it, I’ll be very impressed. * Not that I’ll have one. From Reims I’m training it cross-country straight down to Bordeaux for an epic five days of tasting the 2014 wines from barrel. I am really looking forward to this. With me in the A-team bordeaux tasting car: David Porter of Lea & Sandeman and Joe Wadsack of BBC Food & Drink. Starting early and finishing late, we will be ricocheting from gravel drive to chateau to spittoon, spittoon to chateau to gravel drive. I just had a look at our timetable and it made me feel a bit faint, so I am now going for an Indian Head Massage to chill out. Informal, contemporary – a real winner. 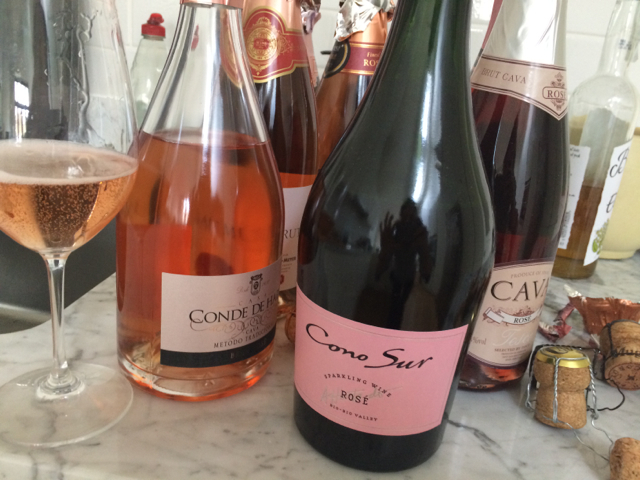 Cono Sur’s sparkling rosé is made from pinot noir grapes grown in the relative cool of the bío-bío valley and tastes of late season raspberries and bilberries with just a lick of refreshers. Easy and jolly and good for parties, it’s also a very smart bottle to look at. The Bouvet Saumur is to the Cono Sur like Constable to Matisse; one is all hedgerows and gentle colours, the other primary and modern. Made in the Loire using cabernet franc, it has a leafyness and is more ‘winey’. Went down very well at a recent wine and food evening I ran, and would be good for wedding receptions too. This isn’t my usual kind of recommendation. First, it’s cava. Second, it’s a deep, raspberries-in-late-August pink, and I’m a sucker for pale rosés. But it’s so much fun, in a take the top off the car and pump happy music out of the stereo in the sunshine with a glass of this in your hand (but only if you’re the passenger) kind of way. Bright, refreshing, vinous cherryade. Clap along and be happy. Pink champagne is always more expensive than white and this is extremely good value for the quality. It’s made using organically grown grapes and some oak. No shortage on flavour. Great stuff. * I always have spare nurofen in my bag. If anyone needs one, please see me. ** If you counted four you are correct. There’s an extra one that didn’t fit in the paper at all.